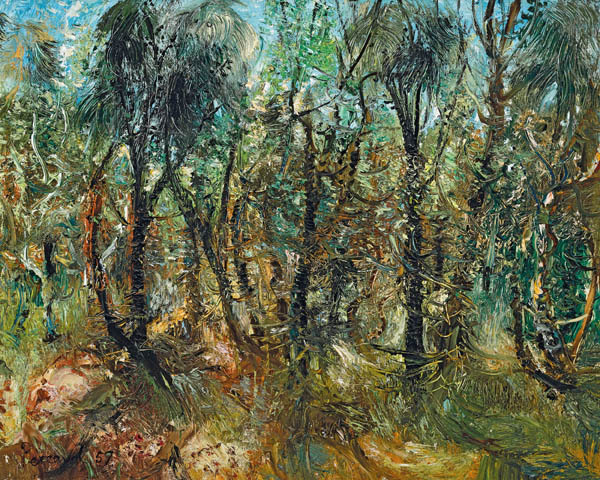 Perceval’s career as a painter began during a period convalescing from polio in the 1930s, and matured while working closely with his friend and eventual brother-in–law Arthur Boyd in the mid-1940s. Perceval’s early paintings were inspired by Vincent van Gogh. Later, together with Boyd and other members of the Angry Penguins, namely Albert Tucker and Sidney Nolan, he drew significant inspiration from the European Old Masters. In particular Perceval drew on the late medieval fantasies of Hieronymus Bosch (1450-1516) and the earthy humanism of Pieter Breughel the Elder (1525-1569) to produce riotous human dramas set in the streets of Melbourne. The influence of Tintoretto’s (1518-1594) febrile colour and energetic brushwork also played an important part by adding to the psychological intensity of Perceval’s work at this time. By the late 1940s however, Perceval and Boyd were obliged to turn to pottery in an effort to earn a regular income. For almost 10 years Perceval barely painted at all, devoting himself to decorating ceramics and only producing a few oil portraits as well as numerous drawings. Perceval’s circumstances changed with his purchase in 1955 of a Volkswagen. From 1956 until the late 1960s he enjoyed the most energetic and creative period of his life and produced many of the paintings on which his reputation now rests. It was during this productive period that he created his famous Williamstown series, the maritime landscapes which are now regarded as his most enduring monument. In fact Williamstown was only one of several areas in or close to Melbourne which he could now visit in his car. The Yarra Valley, Gaffney’s Creek and also Portsea and the nearby Port Phillip Bay coastline were the other subjects that became the focus of his paintings during this period. With paintings such as Ti-Tree and She Oaks Perceval had moved away from the human dramas and parables that characterized his earlier work to become a major and unique contributor to the Australian landscape tradition. Perceval is now less interested in relating a story, but in recording his response to what he is actually seeing, so that his paintings are now animated by a strong sense of the painter himself, as if we are present, standing in the landscape by his side as he works. The resulting sense of immediacy suddenly shifts us from the era of Bosch and Bruegel four hundred years forward in time as we come face to face with New York Abstract Expressionism, and are invited to make a comparison with a near contemporary, the American artist Jackson Pollock (1912-1956). Both artists were producing work which required some nerve to consciously exploit of spontaneity, obliged them to work quickly, and with a degree of physicality in the way they actually approach the canvas with brush in hand to apply paint to the surface. Ti-Tree and She Oaks’ shallow, relief-like depth, with the rhythmic verticals emerging from a haze of paint skeins, achieves much the same effect Pollock’s Blue Poles 1952. Although Perceval’s earliest paintings clearly demonstrate his interest in European art, by the time he painted Ti-Tree and She Oaks he was working in a unique, highly original and independent way. During this intense period, when he embraced the challenges and risks of oil painting, Perceval produced some of the best and most memorable work of any Australian painter of his era.